The previous owner placed their washer and dryer stacked up at the entrance of the service yard because it is within the vicinity of the drainage hole. Since there are also two huge drainage pipes running down vertically around the same vicinity, the appliances are not able to be placed to the wall and hence jutting out. Due to this, the area looks cramped and blocks light from the service yard windows to the kitchen. At the same time, valuable space behind the appliances is wasted. This recess area will fit both appliances nicely and put them out of the way hence clearing up the space and brighten up the area as well as the kitchen. However, before that can happen I will need to do some preparation. I will need to extend the drainage pipe across the room. If I were renovating the floor, I would have this done under the tiles but since I am not I will have to do it on the floor which will be unsightly if not done right. To make it look neater, I will lay them around the room under the windows. That is the best that can be done considering the situation. Components required - PVC pipes, joins. Tools required - saw, glue. Lucky me the water heater is located just above therefore I will be able to tap from there and extend the additional inlet piping down to the washer below. Components required - Copper piping, 3 way joins, valve. Tool required - spanner, cutter. Currently there are no electrical points around the area so I will need to tap from another source. The best source will be where the previous owner plugged in both their washer and dryer as that point will no longer be needed hence there should be no risk of overloading. I practically shift the points without actually physically shifting it. Components required - electrical wires, PVC casing, wall nails and a 3 face plate for an iron, dryer and washer. Tools required - hammer, drill, screwdriver, test pen. I decided not to stack the appliances up and will instead place them side by side. 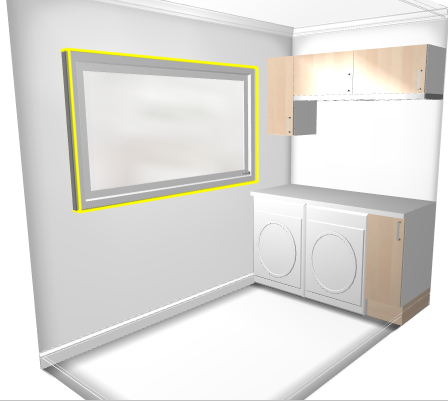 I will then add a worktop on top of the appliances, which will be used for ironing. At the same, I will also add storage space for our laundry needs like detergents etc as well as storage for our bedding and curtains etc. Below are the components needed. - 1.5 m worktop, which is the length of the area, wall to wall. - 1.5 m wall cabinet, which is the length of the area, wall to wall. The height of the cabinets will be determined by the ventilation window for the bathroom on the other side of the wall. I have asked for quotations for the above and it is just too costly. The cost for the worktop alone can get me the full complete set with top and bottom cabinets from Ikea. No doubt the Ikea cabinets are made of particleboard or MDF which is not as good as plywood but with correct usage, I think it should last me a few years before I need to have it changed. Furthermore, the dimensions fits my requirements nicely.. The only component I will need to modify is the worktop which do not come in the size I need. When done, the final unit will look something like this.